There's something a little disorienting about knowing someone both in person and in writing -- odder about knowing someone much better in writing than in person. I remember Kyle Cupp as the slightly awkward looking guy with a ponytail and long dark coat who was writing his thesis on Tolkien as literature and had a crush on one of my wife's co-workers at the college bookstore. Somehow, however, this slight Steubenville acquaintance was enough to allow me both to feel that I "know" him and also to experience a certain indignation when we disagree. Of course, this sort of subjective perception and simultaneously felt familiarity and otherness is exactly the sort of thing that would warm the cockles of Kyle's post-modern heart. Living by Faith is a slim volume which is in parts devastatingly effective writing. It is part memoir, part philosophical/religious testament. 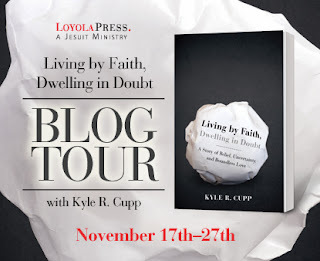 Kyle's observations about his developing faith and understanding as a child, with parents of different faiths who later separated in divorce, are well drawn and interesting. (I hadn't realized till reading the book that Kyle also spent his youth in California. We even experienced some of the same earthquakes.) We tend to think of divorce and religiously divided relationships from an adult vantage point, but Kyle explains the way in which the experience of these divisions shaped his understanding of faith and truth for the rest of his life. The sections on Kyle and Genece's difficult pregnancies, miscarriage, and particularly about Vivian's short life are particularly well written. As a parent, having experienced miscarriage and the early loss of close family, I had just enough in common with Kyle's experiences to feel fully how much deeper he had drunk of that bitter cup. Kyle is honest, unpretentious and frank about the sufferings of a parent going through loss. There were times when I had to set the book aside for a moment until my eyes cleared, but I'm very glad I read it. The human honesty of these segments is powerful, and his love for his wife and for his faith (which he clings to even as he questions it at times) is inspiring, but never mawkish. The more philosophical and religious sections I in some ways found less involving. One of Kyle's primary points, which he returns to throughout the book, is that faith is an act which one may make definitively, but that faith is also always in the context of doubt, because we know neither the whole of the truth about what we believe nor can we fully know the extent to which our choices (including the choice to believe) are pure. My own reaction is somewhat like the scene in the original Hitchhiker's Guide to the Galaxy radioplays where Arthur Dent responds to the news that the Earth was built by mice as a giant science experiment by saying, "This explains a lot of things. All my life I've felt that there's something terribly wrong with the world but that no one would tell me what it was." To which Slartibartfast replies, "No, that's just completely normal paranoia. Everyone has that." Kyle is at great plains to express his doubt and uncertainties, but many of these uncertainties strike me as necessary ones and I can't escape the feeling after reading the book that Kyle is actually a somewhat more devout fellow than I am -- for all his protestations of doubt. Again, this may be phrased in a somewhat post-modern way (and I know that Kyle is a big reader of post-modern philosophy) but what he's saying about the relation of our experience of truth to truth itself is something one could get from Plato as well. Kyle talks a great deal about having to accept his doubts and embrace uncertainty, but I mostly get this impression that this is only in relation to a sort of certainty which no one can have (or ought to think he has.) It's right and important to recognize the limits of our knowledge, as Kyle does, but I'm not sure that doing so needs to be such a source of concern. I'm not clear that it's a dangerous choice so much as our only choice. The Real Adjunct behind "Death of an Adjunct"